of the California Coast is actually in Santa Cruz, but with so many climate zones, it is easier to just declare the Central Coast to extend from Big Sur and south. 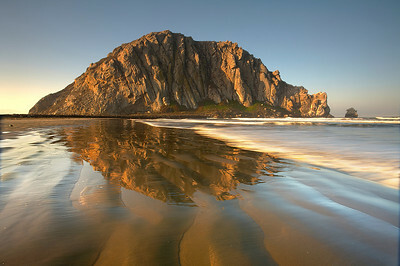 Morro Rock, is the 576 ft. tall plug of an extinct volcano and is one of a series extending for many miles inland. In the winter, the sun cuts across the rock face at sunrise and illuminates the rock and sand ripples perfectly. This low sun angle is the only way to show fine detail in the sand. It only lasts for about 3 minutes, so I had to work fast. A low tide also exposed just enough sand while keeping it wet for the best effect. I liked how the sand ripples pointed in the same direction as the layers of rock. 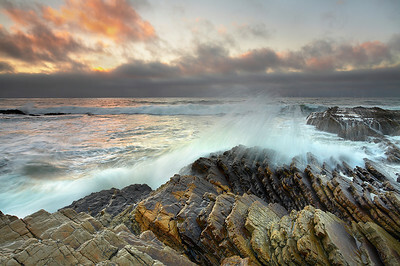 Montana De Oro state park, just south of Morro Bay, California is a spectacular place to see large surf crashing against hundreds of layers of angled rock. I wanted to get close to the action to show the texture of the rock but got drenched right after I took this shot. I covered the camera so I was able to make more images after this. The surf at Montana De Oro State Park near Morro Bay, California can be quite large, so I chose a modest sized wave to show how it feels to be close to the action. The water was moving fast, so a 1/4 second exposure showed plenty of motion. The layers of rock show the long history of this place. 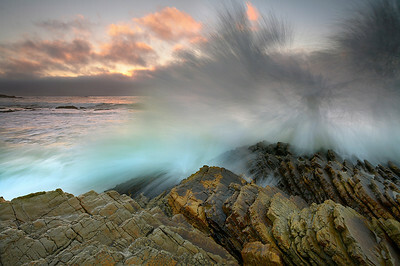 I often try to move in close to the waves to make a dramatic image. Then, I run away just before the wave hits. But with this sort of surface, it was not easy to run or even crawl away. And the rock was quite slippery, which made matters even worse! After the light faded behind the strolling couple (see above), the sky opened up behind the pier. 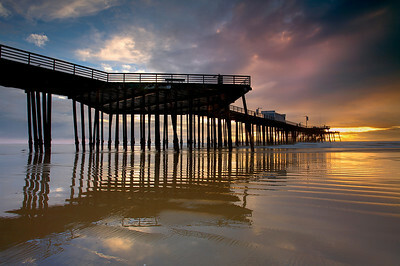 So I positioned myself so the pier would block the sun and when the light was just right and the water was out as far as it would go with the lowest tide of the month, I made the image. I felt fortunate to see this in person! 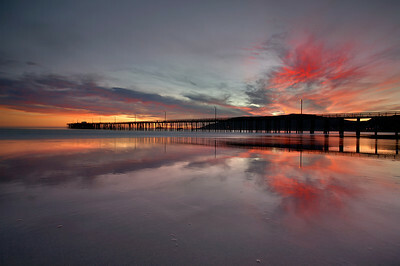 I liked how the underside of the pier lit up and the sand glistened with the red of the sky. A continuation of the series. The rock layers which record the geologic history of Montana De Oro State Park can be read like books in an ancient library. They are angled at 45 degrees and are as slippery as ice. It is difficult to get this close to the surf but this is where the best views are. I waited for a wave to move in between the rocks to show them as being separate. Otherwise they looked like one rock. I also waited for the very last light to strike the rock layers at the lowest angle possible. 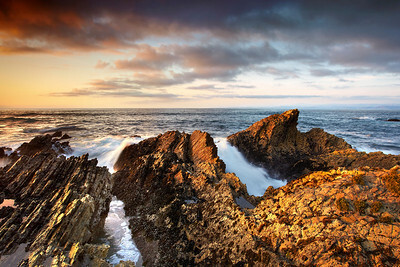 The long historical record of Montana De Oro, California state park can be read like books in an ancient library. Here, a seagull appears to be examining a volume! 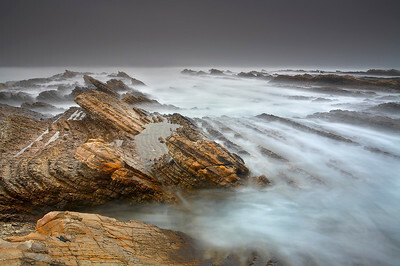 A long exposure emphasizes the rock by smoothing the large surf. Second in a series showing a different view than the first image. The rock layers which record the geologic history of Montana De Oro State Park can be read like books in an ancient library. 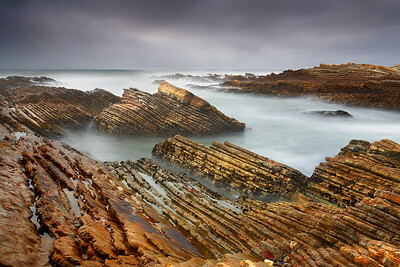 A long exposure emphasized the rock by smoothing the large surf. A shorter exposure would have emphasized the motion of the water and distracted from the incredible rock formations. 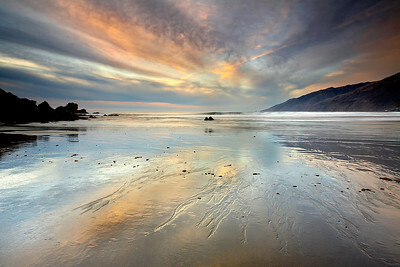 A dark fog moved in just as the sun set to enhance the mood and allow a longer exposure time. The footing on the slippery stone was treacherous. One unusual effect seen here is in the small pool of still water between the rocks on the left below the horizon and ocean. It shows the reflection of the rock layers as lines going in the opposite direction as the rest of the ‘real’ layers. 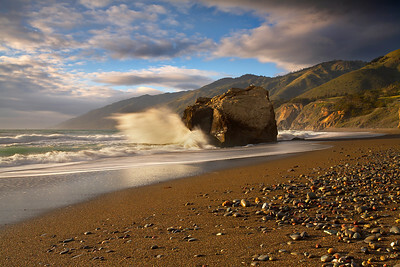 This beach, just at the south end of Big Sur, California may have the most massive views of any beach in the state. The mountains on the right range between 3,000 and 5,000 feet elevation and seem to stretch to infinity. There is an isolated rock over 150 feet tall with its own cave. It looks small on this beach! This 50 foot rock on San Carpoforo Beach at the south end of Big Sur really takes a beating at high tide. The 3,000-5,000 foot mountains make a nice backdrop when the light is right. It took a considerable amount of running back and forth to get the proper perspective, as the water was moving fast. 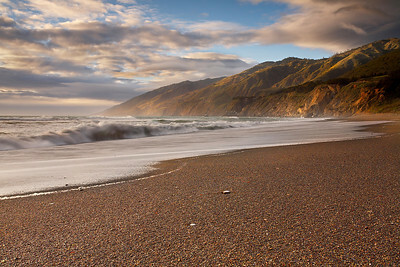 The south end of the Big Sur range feels like one of the most isolated places on Earth. Few people go to this beach, though many pass it by on highway 1 on their way to more accessible destinations. The sand is like coffee grounds and it crunches when you walk on it. A wider view than 'Walking on Glass #1.' This couple was fortunate enough to be witnessing an unbelievable sunset just after an early winter rainstorm was clearing away from the coast. As they walked along, the sky opened and the sun illuminated a low bank of fog and mist right behind them. They stopped and watched it all happen for about two minutes before the clouds returned and the went on their way. 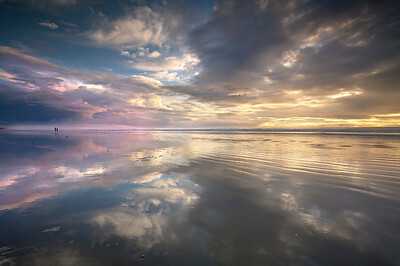 The depth in the cloud deck was impressive and the tide was the lowest of the month at sunset. Everything came together for just a moment on this evening. This couple was fortunate enough to be witnessing an unbelievable sunset just after an early winter rainstorm was clearing away from the coast. As they walked along, the sky opened and the sun illuminated a low bank of fog and mist right behind them. They stopped and watched it all happen for about two minutes before the clouds returned and the went on their way. 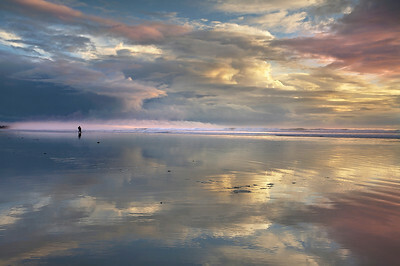 The depth in the cloud deck was impressive and the tide was the lowest of the month at sunset. Everything came together for just a moment on this evening.